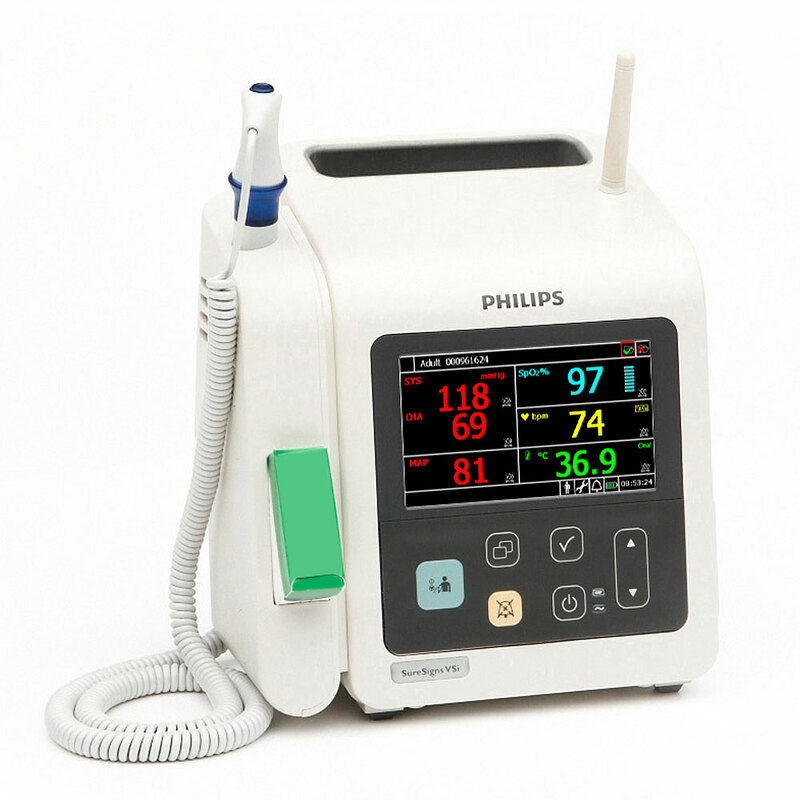 Philips SureSigns VSi Vital Signs Patient Monitor. Affordable patient monitoring in a portable, reliable platform. Simple to use, and easily integrated into an existing network. The VSi can provide direct communication with your facility's Electronic Health Record (EHR) system with programmable bar-code scanning technology, eliminating time consuming transcription, and reducing transcription errors. The VSi is ideal for spot checks on adult, pediatric, or neonatal patients. You can obtain oral temperatures quickly, in just 4 seconds. Initiate a blood pressure check in a snap with the large, one-touch NBP button. Body temp, pulse oximetry (SpO2), heart rate, diastolic, systolic, and mean arterial pressure (MAP) are easily visible and distinguishable on the bright, full-color LED display, an industry first. The full line of VSi patient monitors has been designed for practicality and functionality. For ease of downloading data, the VSi features LAN/serial data export in HL7 format. There is also a USB port for data export and software upgrades. It has a lithium-ion battery as an internal power supply, and an AC power cord for operation and charging. Philips' SpO2 technology is compatible with a wide range of sensors. All of this packaged in a rugged housing with a sturdy handle for easy portability.